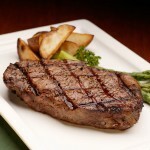 New York Strip Steak. The secret is to use cracked peppercorns, not ground. That solid pepper flavor is what makes this steak so great. Place pepper corns in mortar and pestle, coarsely crush until most of the corns are broken (you can use a coffee grinder or food processor for this step). Cover one side of steaks with crushed pepper and press in firmly, sprinkle with Lime Pepper seasoning and salt. Turn steaks over and repeat the same process . Place in refrigerator for 3 hours, uncovered. Heat grill, brush grate with vegetable or olive oil and place steaks over hottest part of fire for 3 minutes, turn the steaks over for another 3 minutes. Move the steaks to a cooler part of grill and continue to cook until done to your liking. Serve with steak sauce and lots of beer. This is not as hot (spicy) as it sounds. The pepper seasons the steaks just right.